Hi guys can anyone assist with the error I am getting bellow. 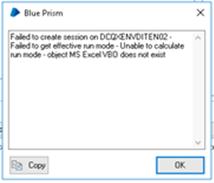 When running the process normally from process studio it runs with no errors, however when I run the process from the control room I get this error saying that the objects are nit connected. So I have some code inside a code-stage in BP and it works. The problem is that it is clunky, long and fragile. I would like to know how could I maybe use a class/es in BP to refactor this code into something more concise and scalable, without having to write an external class-library and then refer to it (this is not so easy to do in my environment). I know it is possible to write methods using the Global Code tab, but could I write an abstract class there? and where would the sub-classes go? How about interfaces? Apologies if this is too basic, I could not find anything previous to guide me on this. Any help or pointers are appreciated, thank you. The code is a basic decision stage that uses input from data item "Main_Segment" and uses local (private) variables "parcel_label" and "found" to output some static values into BP data items "Parcel_Label" and "Found". found = true;       //if first condition is met, assign value of true to "found". if (found = true)   //as "found" is now true, the assignment below is carried out. How can I check if an email with specific subject line is present in Outlook mailbox using Mapiex in Blue Prism? If so i need to read the email, download the attachments and mark that mail as read.